Both in opera studies and in most operatic works, the singing body is often taken for granted. 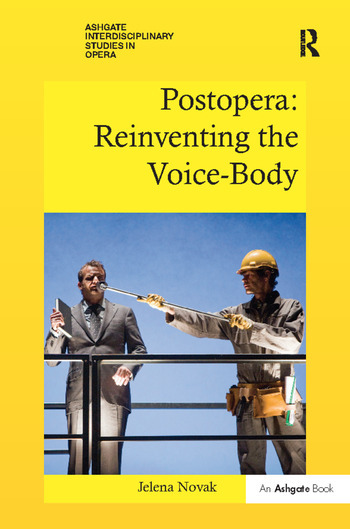 In Postopera: Reinventing the Voice-Body, Jelena Novak reintroduces an awareness of the physicality of the singing body to opera studies. Arguing that the voice-body relationship itself is a producer of meaning, she furthermore posits this relationship as one of the major driving forces in recent opera. She takes as her focus six contemporary operas - La Belle et la Bête (Philip Glass), Writing to Vermeer (Louis Andriessen, Peter Greenaway), Three Tales (Steve Reich, Beryl Korot), One (Michel van der Aa), Homeland (Laurie Anderson), and La Commedia (Louis Andriessen, Hal Hartley) - which she terms 'postoperas'. These pieces are sites for creative exploration, where the boundaries of the opera world are stretched. Central to this is the impact of new media, a de-synchronization between image and sound, or a redefinition of body-voice-gender relationships. Novak dissects the singing body as a set of rules, protocols, effects, and strategies. That dissection shows how the singing body acts within the world of opera, what interventions it makes, and how it constitutes opera’s meanings. Contents: Foreword, Louis Andriessen. Part I Focusing on Body Singing: Postopera and vocalic body; Body-voice gap, postopera and body/voice theory. Part II Voices Beyond Corporeality: Performing Singing as Upgrading: Singing beyond the body: uniqueness, intruder and prosthesis; Monstrous singing: the politics of vocal existence. Part III Throwing the Voice, Catching the Body: Opera, Ventriloquism, and De-Synchronization: Operatizing the film: body without voice and voice without body; Singing letters, multiplied bodies, and dissociated voice. Part IV Singing Gender as a Performance: Voice and gender standing apart; Vocal drag, counter-castrato, and the scandal of the singing body. Reinventing the vocalic body in postopera: conclusion. Bibliography; Index. Jelena Novak works in the area of musicology, opera studies, performance studies, dramaturgy and criticism. She is a postdoctoral research fellow at CESEM (Centro de Estudos de Sociologia e Estética Musical), New University of Lisbon, Portugal with the project 'Opera beyond Drama.' She has been a founding committee member of the Society for Minimalist Music and a founding member of the editorial collective TkH (Walking Theory). In 2013 she won the Thurnau Award for Music-Theatre Studies.